Locks 4 Vans bring you the finest products on the market with the T Series Deadlocks which are now Thatcham approved, the T Series Deadlocks are designed to give you maximum security even if your original locks are compromised as the door still will not open with the deadlock in the locked position. 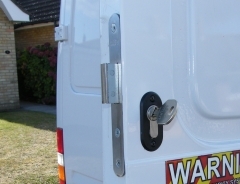 The lock also serves as a visual deterrent so with easier pickings along the road your van will be a lot safer, the T Series key is designed to be the ultimate in security and strength. The key is manufactured from solid nickel silver, the large easily gripped bow is branded with the L4V logo signifying that this is an automotive product, unlike similar products the solid bow cannot be twisted off. S Series: The S Series key is more like your traditional Yale type key with the key cuts on the edge of the key, although it is a controlled blank and not one that is available over the counter in this country. T Series: The T Series key is a security dimple type key with different depth holes drilled into the flat face of the key, this key is more resistant to picking, is stronger and has Thatcham approval. To Sum up, having either lock on your van will improve it's security massively, most van break in's are probably done in seconds rather than minutes by taking advantage of a manufacturers weak point. That weak point might be people punching screwdrivers in under door handles, by breaking off big plastic handles or by smashing glass, the point is that if a van thief knows that they can break into a particular model van in 30 seconds with out making any real noise then they know that they can do it to every one of those thousands of vans up and down the country, this makes it easy for them to pop it open just to look and see if there are any tools or anything of value in your van. Don't make it easy for them, instead make it 10 or even 100 times harder with either the S or the T series deadlocks and they might as well carry on and pop open the one parked down the road from your van as harsh as that sounds for them. Anyone that leaves expensive tools in any van with out any aftermarket security is asking for trouble. You may also be able to get a discount on your insurance for your van or van contents? The price quoted is price per lock (based on 4 or more locks) fitted on the same vehicle at the same time, please note there may be a supplement of up to £30 for any less than 4 locks. Locks 4 Vans T SeriesDeadlocks fully fitted Locks 4 Vans T Series deadlocks.